We warmly welcome Biophysicists and IUPAB members from around the world to join us in Melbourne in 2018 for stimulating scientific sessions and an opportunity to network and socialise with colleagues. Please see the ABA2018 website for further details. 6th International Iberian Biophysics Congress and 10th Iberoamerican Congress of Biophysics. June 20 – 22, 2018, Castellón (Spain). Bursaries Application: February 20th 2018. Early Registration (low fee): March 23rd 2018. Abstract Submission: April 15th 2018. Late Registration: June 20th 2018. Please, visit the Congress Web Site. Dates and times: Thursday 13 July, 17:00 – Sunday 16 July, 12:00. Dates and times: Thursday 20 July, 14.00 – Friday 21 July, 15.00. The Quantitative Approaches to Antimicrobial Resistance meeting will be held immediately following the 19th IUPAB congress and 11th EBSA congress at the Edinburgh International Conference Centre from 2pm on Thursday 20 July until 3pm on Friday 21 July. The meeting aims to bring together microbiologists and biophysicists interested in using quantitative approaches for understanding antimicrobial resistance (AMR). AMR is a highly topical area with a growing biophysics community across a range of areas from instrumentation for interrogating living bacteria and their interaction with the host, to the application of statistical physics to the development of resistance genes. Contributions are invited for oral and poster presentations. Abstracts should be a maximum of 200 words and submitted online at amr2017.iopconfs.org/abstracts by 8 June. 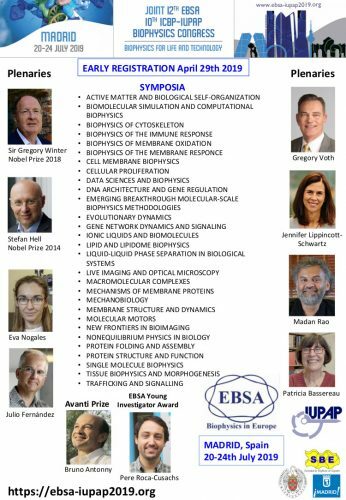 Biophysical Approaches to Protein Folding and Disease is a satellite meeting to the European biophysics congress (IUPAB-EBSA2017) in Edinburgh, UK. It focuses on how complementary molecular-scale biophysical methods can be applied to the timely study of the biomedically-pressing issue of protein misfolding. 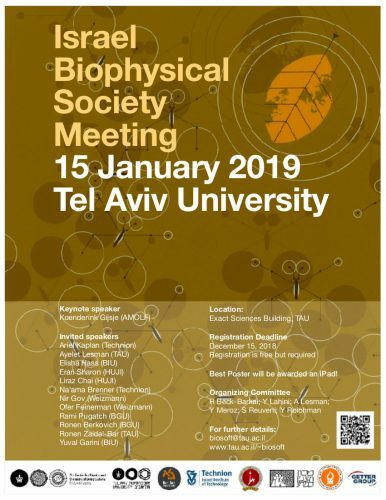 It is organized by the ARBRE-MOBIEU molecular biophysics European network (www.arbre-mobieu.eu) and can be accessed whether or not you participate in the Congress. It will start at 15.00 on July 20th and finish at 18.00 on the 21st, and includes keynote talks by Tuomas Knowles (Cambridge, UK), Maria Pennuto (Trento, Italy) and Sheena Radford (Leeds, UK). Letters of Intent can now be lodged to host the 21st International Biophysics Congress to be held in 2023. The closing date is December 31, 2016. The deadline for lodgement of the actual bids is May 01, 2017 and bids should be submitted in pdf. with videos, complex graphics, etc. to be available by link to a specific website for the bidding country. As in previous years, bidding countries may arrange to host presentation functions in Edinburgh at their own cost at the congress venue. Previous congresses have been held in Amsterdam (1999), New Delhi (2002), Montpellier, France (2005); Los Angeles (2008) ; Beijing (2011); Brisbane (2014). 2017 will be in Edinburgh and Rio de Janeiro in 2020. IUPAB does not itself make the choice. The location for the 2023 Congress will be decided by vote of the delegates to the Edinburgh Congress. There should be a range of accommodation to appeal to early career scientists (young post-docs, etc) as well as Council, Executive and invited speakers. As IUPAB usually pays accommodation for invited speakers if they are not covered by their own institutions, then it is desirable that there is a competitive rate, and there should be some economy of scale for such a large conference. Voting to choose the venue for the 2023 Congress will take place at the General Assembly in Edinburgh in July.